and Marvin Garland, Serco Inc. The US Navy's new standardized addressing system will help dispatchers route police and ambulances to emergencies. 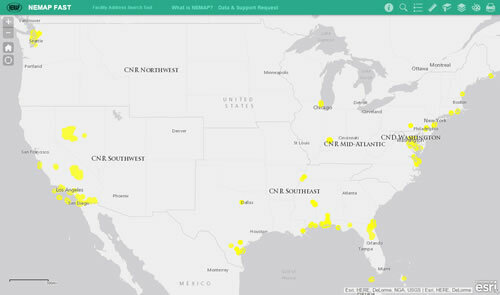 Serco Inc. and GISi teamed up with the US Navy and local governments to work on the addressing project, using Esri ArcGIS to manage, store, and edit the address data. The project's stakeholders used ArcGIS Online to collaborate on a review of the interactive maps of the naval sites. Read the article. A standardized geospatial addressing system, supported by Esri technology, will help the US Navy route emergency responders to incidents. 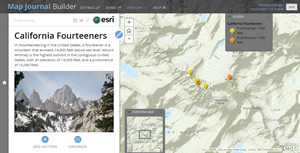 Learn how to add maps to the Story Map Journal and get other useful tips for creating a compelling, map-based narrative. Read the tip. Canadian students used ArcGIS Online to study the pros and cons of the proposed Northern Gateway Pipeline, which would run from Bruderheim, Alberta, to Kitimat, British Columbia. Read the article. On one special day each year, GIS professionals host events to showcase the power of maps and geospatial analysis and inspire young people to get interested in GIS. Read the article. The first person to register for this summer's Esri User Conference leads an organization that, besides being one of the first Esri customers, uses cutting-edge GIS technology today. Read the article. Combine the power of Landsat imagery and ArcGIS using a simple web app. Zoom in and look at the earth's geology and study the moisture and vegetation indexes, rock formations, and more. Begin exploring. Esri will host a massive open online course called Location Advantage for business professionals and students. Sign up. Build a 2D map of the city of Venice, Italy, and convert the map into 3D to analyze the threat of flooding. Then learn to give your scene a realistic appearance and share it with others. Take the Learn ArcGIS lesson. See where glaciers are retreating and advancing in Alaska by comparing historical and modern photographs and recent imagery displayed in an Esri Story Map Journal. View the Alaska Ice Story Map Journal. Do you need to build and support native apps for multiple platforms? Esri will soon release AppStudio for ArcGIS, now in beta, which will make the process much easier. Watch the video. Join the beta program. Dimension Explorer, a new add-in tool for ArcMap in ArcGIS 10.3 for Desktop, gives you slider controls for navigation when working with time-aware and multidimensional data. Read this blog. Learn how to create Python script that runs as a tool in ArcToolbox. The tool automatically batch processes ArcMap documents, gathers information about the documents, and more. Read the article. ArcGIS Online now suggests what maps make sense for your data to help you better communicate your message. Read the blog. Watch the video. Get a sneak peek at one of the new Esri crowdsourcing app templates designed for engaging communities. View Crowdsource Reporter. Film Buffs, Where Are You? Which Americans like to watch horror movies, and which prefer comedies? Data from Esri will show you. Read the blog. View the Story Map Journal. Esri offers Cutting Edge servers preinstalled with ArcGIS for Server on both Windows and Linux to bring the power of GIS to your organization. Order today. ArcGIS Open Data now includes more than 22,415 open datasets from 1,600 organizations, including the City of Minneapolis, the State of Maryland, and the Environmental Protection Agency. Start exploring. Students can use ArcGIS Online maps and data to investigate temperature extremes around the world. A lesson is included. Read the blog.